Marked by a fairly heavy update, the Zafira Tourer is entering its twilight years as the last of a breed. 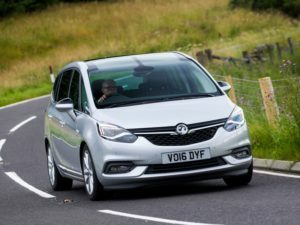 The standard Zafira quietly disappeared in 2014, and the smaller Meriva made way for the MPV-SUV Crossland X crossover earlier this year. Which makes this the only people-carrier Vauxhall sells. This is a corner of the market that’s really suffered since SUVs became the family-hauling car of choice. That MPVs offer better interior flexibility and the same raised driving position almost doesn’t matter any more. 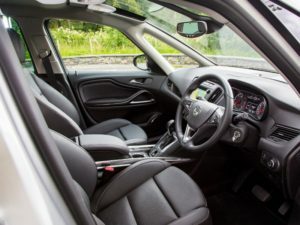 Which is a shame, because the Zafira Tourer managed to combine a genuinely modular cabin with saloon-esque comfort and enough style not to look like a van with windows. A lot of that hasn’t changed. Ditching the Ampera-like front end has sacrificed some of its identity, but anyone familiar with the old car – or Vauxhalls of old, for that matter – will be glad to see this follows the latest models in terms of its de-cluttered cabin. The button-covered dashboard has been simplified, with lesser-used functions moved into the touchscreen. Thankfully that doesn’t include the climate control knobs, or the volume control. There’s far more practicality on offer here than in most SUVs; seven seats, all suitable for adults, and a square back end with a wide-opening tailgate and flat boot floor that can be extended, with a tug of a strap or handle, all the way to the front row. 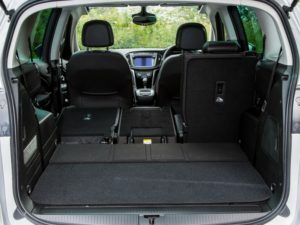 Vauxhall has also found space to store the load cover under the boot floor when it’s not in use, which means there’s no need to dump it in the footwells if there’s a sudden need to carry seven occupants. Standard equipment is generous from the range entry point – if you need a cost-effective way to move people and objects, it’s hard to argue with even the basic Design trim. Cruise control, DAB radio, and smartphone mirroring for Android and Apple devices are all standard on all Zafira Tourers. The latter means those with occasional need for navigation can use their phone’s mapping service via the car’s touchscreen, rather than paying to have it built in. But it’s Tech Line that’s targeting fleets. This adds some useful features for job-need and user-chooser drivers; automatic lights, wipers and climate control, for example. It also gets the clever rear bench with a central seat that folds into an armrest, enabling the two outer seats to slide inwards for more elbow room, and the sliding storage compartment up front. Navigation with the excellent OnStar personal assistant service, and on-board WiFi to keep kids happy on long journeys, are also desirable features. Vauxhall offers all three engine options on the Tech Line; the gutsy but retail-focused 1.4-litre petrol, the likely big-selling 1.6-litre diesel at 134bhp, and the 168bhp 2.0-litre CDTi as tested here. The bigger diesel makes good business sense, at 129g/km versus 119g/km CO2 and with only £200 separating it from the 1.6-litre unit. But there’s no sensible automatic option in the range; it carries a 32g/km CO2 penalty in the 2.0-litre diesel, and the 1.6-litre is manual only. Even with the effort of changing gear manually, the big engine suits the Zafira Tourer. It’s better suited to being fully loaded than the 1.6-litre, which is just about powerful enough to carry heavy loads, and fuel economy of around 50mpg is typical at motorway speeds. Expect a sporty drive and you’ll be disappointed, but it’s a very easy-going, comfortable way to cover ground. This may be a declining segment, but there are some things the fashionable SUVs just can’t match. The biggest threats perhaps come from within the PSA Group, in the C4 Picasso and surprisingly flexible new Peugeot 5008 SUV. There’s a gap in the Vauxhall line-up for a seven-seat crossover, and it will be interesting to see what shape this car’s successor takes.